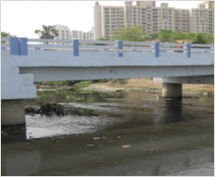 Excavation of drainage channels with improvement of capacities of existing drainage channels along with resuscitation of derelict and silted up drainage lines is another area where we have done considerable work in last twenty-five years. 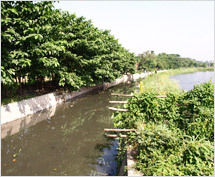 During this period, the drainage schemes for Kendua Beel Basin, Haroagong-Kultigong Basin, Moyna Basin, Jamuna Basin, Ghea-Kunti Basin, Kherai-Buxi Basin, Bhagawanpur-Nandigram area and Keliaghai-Kapaleswari-Baghai Drainage Scheme have been taken up and are nearing completion. Besides, the work of Tamluk Master Plan has also been taken up to extend benefit by way of drainage as well as irrigation in the dry season. 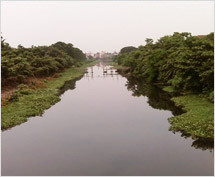 The lifeline of drainage of Kolkata town and its suburban metro areas are the open drainage channels (khals) forming a network viz. Nowi, Bagjola, Kestopur, Bhangore Kata, Khardah, etc. After 1999 flood, a High Power Committee under the Chairmanship of Dr. P.N. Roy, Member, State Planning Board was constituted, to suggest measures to remove persistent water logging of Kolkata and its suburbs. To implement their recommended remedial measures the State has taken loan from HUDCO and is now proceeding to complete the same by December 2002. The works undertaken are improving drainage capacities of the Nowi with ita branches, the Bagjola with its branches, Kestopur, Bhangore Khata, Khardah Khal, etc. in the North 24-Parganas. 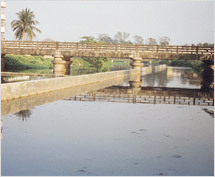 Existing waterways of several Railway and Road Bridges of these canals are being widened. A Pump House at a cost of Rs. 22.00 crores is being constructed at the outfall of the Bagjola Khal. 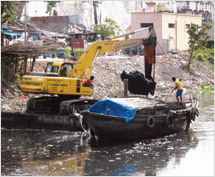 In Kolkata, improvement works in the Circular Khal and all the drainage channels connected with pump houses of the Calcutta Municipal Corporation are in progress. 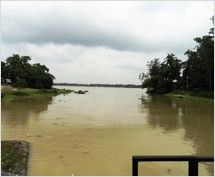 Improvement works are going on in the Tollygunj Panchannagram Canal and its intercepting channels having a good number of branches in the South 24-Parganas. Work is also going on in the Churial and Monikhali Khals and their branches in the district. The Department is going to take up ADB Loan of about Rs. 140.00 crores (one hundred and forty crores) for construction of 4 Nos. of Pump Houses on 4 major drainage channels along with lining works.